Viewers can watch the attempt on ESPN3 at noon Monday here. PHILADELPHIA -- After a year of waiting, and finally healthy, Phillies' shortstop Jimmy Rollins is ready to try again. 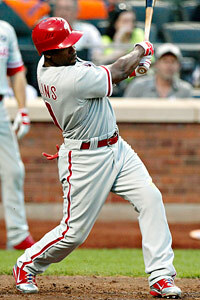 AP Photo/Frank Franklin II Jimmy Rollins on Monday will try to hit a ball farther than Babe Ruth. He will try to pass The Babe and etch his name in the Guinness Book of World Records by hitting a baseball farther than anyone. Even if he needs a souped-up aluminum bat and a "ballpark" that extends the length of the Ben Franklin Parkway in Center City to do it. "I think I'm the right guy for it," Rollins said. "Unlike a Ryan Howard, with me -- 5-7, 165 pounds -- that's when it becomes a challenge. We really get to see how advanced science and technology are. It'll be a breakthrough for science; a breakthrough period just to know how far a ball can travel when you take all restrictions off." Rollins, 32, will make his attempt, called "Red Bull Cranks" at noon on Monday on the Parkway, where he'll try to surpass Ruth's 1921 575-foot blast in Detroit. "When they came up with an idea to see far how a batted ball could go, I said 'I'm with it'," Rollins said. Rollins was slated to do this in April 2010, before straining his calf prior to the Phils' home opener. It never healed to the point he felt he could go safely forward with the stunt. "The last thing I want to do is go out there and re-injure myself swinging the bat," said Rollins, whose contract expires after this season. "But there's not any hesitation going forward with it this year." The Parkway, a major Philadelphia thoroughfare, will be closed from noon to 2 p.m. on Monday for the attempt. Rollins estimates he'll take 10-15 swings off his bullpen coach Mick Billmeyer, and is convinced that will give him his best shot. "At the end of the day if I do it, then I'll be in the Guinness Book of World Records until someone else attempts it and more science and technology come along," said Rollins, who also will host a charity bowling event for arthritis Monday. "But I'm not gonna be out there all day trying to get this done."